Garden Planner is an easy to use garden and landscaping design tool. 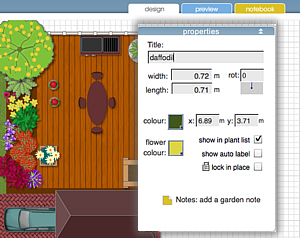 Arrange plants, trees, buildings and objects using an easy to use 'drag and drop' interface. Use tools to quickly create paving, paths and fences. Use the Vegetable bed tool to easily layout vegetable and herb gardens. Then produce a high quality color image or print out of your design. No subscriptions, no in app purchases. Just good old fashioned software, where you pay for it once and you've got it for ever. All future updates are free, and if you get a new computer you just can transfer it over. 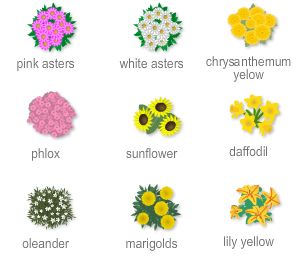 Garden Planner includes a library of over 1200 plant and object symbols, all of which can be customized. Plus easy to use drawing tools that let you draw out paving, decking, paths, walls, fences, pools, ponds and more. Use the Properties Window to adjust the appearance of anything in Garden Planner. The symbols can be easily customized in size, color and style to represent an almost unlimited range of plants and objects. 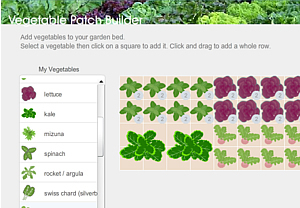 Use the Vegetable Patch Builder to layout planting Beds. The simple grid layout means you can plan out veggie patches and herb beds with ease. Ideally suited for square foot gardening, kitchen gardening and home / community veg. beds. Try out the new 3d view in Garden Planner. Try designing your dream garden online. Don't want to download the trial and just want to see how it works right now. Then try the online demo. Please Note: the online trial does not support saving designs. People all over the world are using Garden Planner to do amazing things.